FO4 is launched most places now, (except Japan?). Ending updates to this thread. Looks like Beth has released an official Fallout 4 trailer. World has gone to the dogs, one car has the brotherhood icon painted on - just before we see an 'inert' brotherhood in full battle armor ... is s/he really inert, or just watching? http://bethsoft.com/en-us/news more news June 14 at 7PM EST from their E3 conference. Use twitch. Doesn't seem like this is another 'fake' trailer. I'm excited... your thoughts, hopes, etc? 2) Beth told GameSpot that the PC specs will be released about a month before FO4 launches. Despite my initial hate for the change to first person in F3, it grew on me and i really loved the game in the end. Can't wait!! As soon as a release window is announced I'm counting on you, ElanaAhova to let us know . For you RavenX, always... BTW, one big box store is taking pre-orders... but we both know how 'fast' that might be. You want the big box url? Oh you know I do, m'lady. Please, hooketh a brother up. Do want and mod it up... oh the waits gonna be painful. Got that right. I'm hoping they'll say by the end of this year, but honestly I'm expecting next year. I think they announced Skyrim over a year out didn't they? Been a while now to remember. Sure they can't mess it up with GfW, but it still has to go through microsoft and sony submissions for the console versions. It's not that dissimilar, and since one of those will be the lead sku us poor PC users will likely get rubbish for controls and interface (at the very least). Likely - but the beth (TES / Fallout ) modding commmunity is quite robust... I expect a mosified HUD, UI, etc. to be up and running very quickly. I have to agree. The PC interface/controls for Fallout 3 and Skyrim were both great. Bethesda is Great at catering to those of us in the PC crowd. People were worried they would "consolize" the controls for both of those but the PC controls were the best all around IMO. I don't think we'll have anything to worry about there. Also with modding as you say, there won't be a lack of options I'm sure. You are most kind, m'lady, thank you. I think I'll avoid BestBuy though. I'll wait for Gamestop to get their pre-orders up and then I'll go down there and put money down on the boxed PC version, probably the same day I pick up Arkham Knight later this month. Steam has Fallout 4 Pre-Purchase available already as well, but this is going to be a in-the-box buy for me. The only thing I hate about that is when they Don't do a midnight release and I have to wait until the next morning when I know Steam people are playing at midnight the night before. I wonder if our Fallout 3 saves will have any impact on Fallout 4? That would be awesome if they did. I'd have to play through part 3 again though as I don't have my save game for it anymore. Rumor is October 23rd ... the day the war started in Fallout. Do you remember what time the clocks stopped? Nah, i am not that much a nerd. Release will be Nov 10th it seems. The Net is going crazy, the E3 Show was good, apparently. It was good. Pet play, buildable stuff, pipboy minigames, customizable weapons etc all on top the standard formula. Looked like a top-of-the-line AAA game. Also an ios game called fallout shelter available now. Android coming later. yes, yes. I think we can count on November. But the 10th? Lets hope! For people who missed it, here's the entire Fallout Coverage clipped into one video. It's all Fallout 4 except for a 3-4 minute part in the middle which is a Fallout iOS game they did (that's already out btw). November 10th baby, F YEAH!!! Christmas is coming early this year!!! 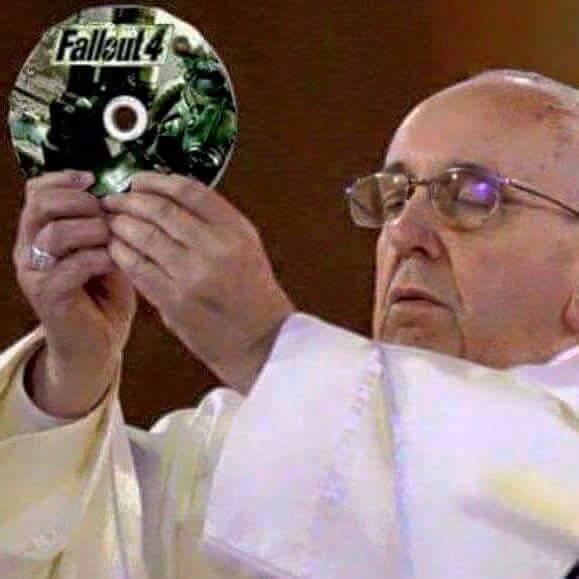 So is anyone else as Blown Away by Fallout 4 as I am? I went out and put $20 down on my copy tonight when I paid off Batman: Arkham Knight. I was going to spring for the collectors edition this time around, but you need a cell phone to put in the pip boy and I don't have (nor want) a cell phone. If I had that pip boy though I'd want to be buried with it...lol. You know, in case they ever dig me up and make a ghoul or super mutant out of me in the future. At least I'll be prepared. Seriously though this looks AMAZING. I think I've watched the above video I posted at least 5 times today. I am like totally blown away. The attention to detail, the before and after, player modifiable weapons, power armor, 111 survivor based on couple created at game start. I would love a pip boy for my wrist - maybe finally go cos-play? And I am really, really excited about the modding prospects. The char gen system is same one used for making NPCs - I see so many possibilities. And the beauty, the light affects, blown away, I am. If the quests and story line, the Institute, etc., are as well done as what we have seen in the game so far - well - blow me away, over and over again. I have never been excited about a new game coming out. Skyrim, X-com, OK, cool. But excited - anticipating release of Fallout 4 is exciting. I usually wait and get games on sale. This wil be the first time I don't wait. One concern: Wish I knew what PC specs are necessary to play Fallout 4 with he same graphic settings we see in the previews. 111 survivor based on couple created at game start. I think that's just the baby at the start (unless it plays into the game later). You play as the guy/girl you make at the start. During the video Todd Howard says the baby is based off what the couple you make looks like, but, he also says when you emerge from Vault 111 you're the only survivor. So, presumably the other character you don't pick and the baby both die in the beginning. I'm thinking though if they go through the trouble of generating the baby based off what those two look like it'll probably play in later. I saw something about the specs when I did a Google search on that very thing. Not sure if it was reliable but I'll check and see if I can find it for you. I don't think the specs will be too much higher than Skyrim's though. I was thinking the player character is the baby. Likely? I know the vid said you start as the character on screen when you exit that screen... but maybe... misdirection? Oh, who knows.... LOL. When you watch the vid, it's the guy in the mirror who comes out of the vault 200 years later, and his Mr Handy even recognizes him and calls him by name. I'm thinking in the vault you go into some kind of "stasis" or something, he says he's not giving away the spoilers, but it's still you 200 years later. That means either the character you don't choose and the baby either die, or they're somehow saved too and maybe get out before you. He even says you're the only survivor of vault 111. I am hoping you run into the character you don't choose (husband/wife) at some time later though, or maybe your own grandkid. You definitely come out of the vault 200 years later as the character you make though, he just doesn't say the specifics of how.